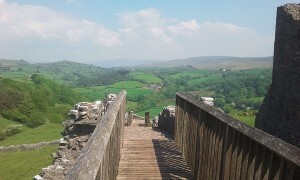 Carmarthenshire has many interesting places to visit come rain or shine, and Llandovery is well placed to get to them. Aberglasney Gardens is the site of an exciting restoration project, the gardens are magnificent all year round and the cafe offers some lovely local food. Botanic Gardens of Wales is a whole day out in its own right, the formal gardens, orchid house and the exciting giant glasshouse (designed by Norman Foster) are fascinating and then the nature reserve and other outdoor areas are well worth some time to explore. The gardens have a great cafe or you can picnic in the Mediterranean surroundings of the great glasshouse. Carreg Cennen Castle (and walk) is a spectacular, privately owned, castle perched on a sheer rock escarpment, there is a pretty walk in the woods around the castle, into the beech woods which give you a brilliant view of this must see castle. There is a lovely cafe which has great views of the castle. Dynefwr Castle is owned by the Wildlife Trust of South and West Wales and is an impressive 12th Century castle perched on an escarpment looking out across the Twyi Valley. Dolaucothi Goldmines are Roman gold mines and were in use until the 1930s, a very interactive day out you can even pan for gold. Newton House is very hands on, you are not segregated from precious antiquities, instead you can interact with the knowledgeable guides. Llandeilo is a pretty market town with a fascinating history, lots of boutique shops and good places to eat, such as the fun GinHaus.